Working alongside the Client’s Environmental Consultant, VertaseFLI acting as Principal Contractor, co-ordinated the demolition and remediation of the Quay Garage site. Hydrocarbon contamination was present on site in the soil and groundwater from historic leaks. Due to physical site constraints it was not possible to excavate and remove all of the hydrocarbon contaminated materials. Treatment of residual contamination was achieved through the injection of an Oxygen Release Compound (ORC) directly into the contaminant plume. The working area of the site was bounded on three sides by party walls and its remaining side by a busy public highway. The demolition of the former garage including the removal of asbestos bearing materials. 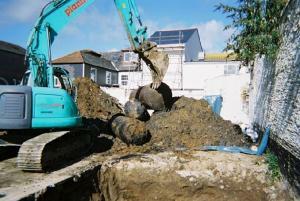 Site works had to be actively managed to ensure that no damage to adjacent property resulted. Decommissioning, degassing and removal of eight below ground fuel storage tanks. 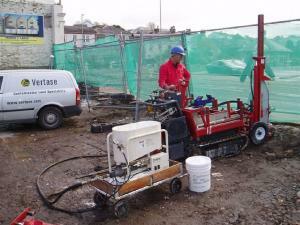 Hydrocarbon contaminated soils were excavated for off-site disposal at a licensed waste management facility. 10 injection wells were installed to a depth of 6.5m and ORC was injected to form a vertical reactive barrier. Post injection validation monitoring indicated that the treatment had been successful and that remediation objectives had been achieved.